Babs Bunny (voiced by Tress MacNeille in the English version and by Miina Tominaga in the Japanese version), is a 14 year old hyperactive pink bunny, a female performer who will do nearly anything for a laugh. She is good at improvisational comedy, and is a comedic impressionist in the vein of Robin Williams. Her full name is Barbara Ann Bunny, but she hates being called that. In "Fields of Honey," Babs went insane looking for a female mentor, and eventually found one: Honey, a forgotten actress from the old Bosko cartoons. Many fans of Babs Bunny have noticed that her fur goes through various changes in colour and coverage. Her tummy fur appears to be either pink or white and when it is white, it sometimes extends to her tail, and sometimes it stops at the bottom of her abdomen. Perhaps she is related to the Artic rabbit! Buster J. Bunny (voiced by Charlie Adler and John Kassir in the English version and by Ryûsei Nakao in the Japanese version), is the leader of the Tiny Toons gang, a street-smart blue rabbit who had to deal with the challenges of a tough school curriculum, the machinations of rich kid and local bully Montana Max (he was once good friends with him, however), and the advances of crazed and dippy animal lover Elmyra Duff. Like Babs, he will do anything for a laugh. Steven Spielberg Presents Tiny Toon Adventures (a.k.a. 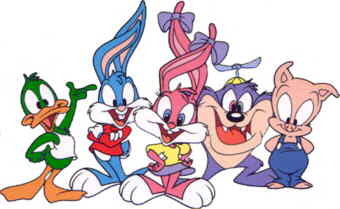 Tiny Toons) was an American animated television series created by the Warner Bros. Animation studio. It was the result of the first collaboration between Steven Spielberg and the newly reborn Warner Bros. Animation studio. The first season aired in 1990, the second season was aired in 1991, and the third and final season was aired in 1993. The idea for the show was that of Terry Semel, then president of Warner Bros. In the mid-1980s, he saw how successful and popular younger versions of famous characters like Ultraman Kids, Muppet Babies and Flintstones Kids were, and thought of doing a kids version of Looney Tunes. Originally, the characters were going to be the offspring of the Looney Tunes and Merrie Melodies gang or Bugs Bunny and co. themselves as children (an idea which perhaps ended up becoming Baby Looney Tunes). It wasn't until Steven Spielberg and his hugely successful production company Amblin Entertainment (makers of hits like Gremlins and Gremlins 2: The New Batch, the Back to the Future Trilogy, Who Framed Roger Rabbit and more) got involved that characters became spiritual, not literal, descendents of Warner's famous cartoon stars and that the kid characters would be the protegés of the Golden Age WB animated cartoon film stars. Early on, the characters were intended to be used in a theatrical feature film, but in December of 1988, it was officially decided that the Tiny Toons would instead be used in a television series.